« Prefunding retiree health care: Is this the year? Bankrupt San Bernardino’s new budget restarts CalPERS payments in July after skipping about $13 million in payments this fiscal year. But the next step in the city plan, getting CalPERS to refinance the unpaid bill, is a no-go at this point. The giant pension fund, alarmed by the unprecedented decision to stop making required pension contributions, is in no mood to give the city an easy out that might tempt other struggling local governments to take the same path. Restarting general fund pension contributions will not cause the California Public Employees Retirement System to drop its opposition to San Bernardino’s eligibility for bankruptcy, Amy Norris, a CalPERS spokeswoman, said last week. San Bernardino, California’s 17th largest city with a population of about 210,000, made an emergency filing for bankruptcy last August. The city said it needed to stay debt collection to have enough cash to meet its monthly payroll. 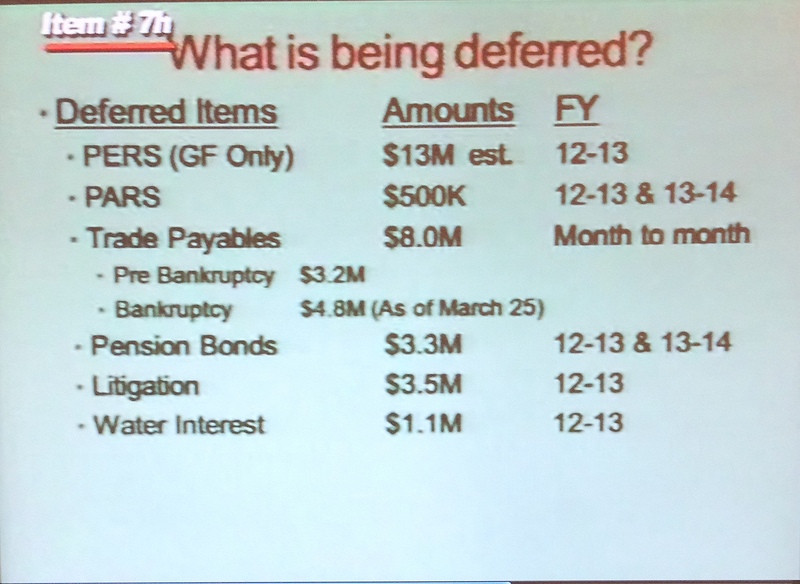 A 14-month budget approved by the San Bernardino city council last month is based on a “pendency” plan for operating in bankruptcy adopted by the council last November. Under the plan, the city is not making or “deferring“ $37.4 million in general fund debt payments owed in the current fiscal year that began last July. Nearly half of the amount is for pensions. The plan defers a $13 million payment to CalPERS, $500,000 to Public Agency Retirement Services (a private firm that provides pension add-ons) and a $3.3 million annual payment on a $50 million pension bond. The odds that CalPERS eventually will agree to stretch out payments on the city’s previous pension debt or “unfunded liability,” along with the skipped $13 million annual payment, do not look good. For one thing, a leading reason that CalPERS adopted a rate hike last month of roughly 50 percent over the next seven years is to get to full funding in 30 years, rather than much later under the previous actuarial policy. And for another: “We have not received a proposal from the city, and we are not going to amortize the unpaid contributions,” a CalPERS spokesman, Joe DeAnda, said last week. CalPERS unsuccessfully tried to sue San Bernardino in state court to get the pension payments. If the city is ruled eligible for bankruptcy, CalPERS fears that a “plan of adjustment” to cut debt will include the pension payments. “It is not mere speculation to say that the city may not be able to pay its post-petition bills after languishing in bankruptcy for an indeterminate amount of time,” said a CalPERS filing in federal bankruptcy court. “To the contrary, the pendency plan suggests that the city has no intention of paying its postpetition obligations to CalPERS but, instead, intends to ‘modify’ those administrative claims in its plan of adjustment,” the filing said. As in the Stockton bankruptcy, what would happen if pension debt is cut has not been spelled out. There may be a number of possibilities, ranging from business as usual to pension cuts. For example, would the city pension fund simply continue with a lower funding level, as often happens after major investment losses during an economic downturn? Or would pensions be reduced in some way to reflect the new lower funding level? The San Bernardino bankruptcy is an ongoing drama. A new city manager and finance director hired in April of last year quickly discovered that the city would not have enough cash to meet payroll by August. Then the city manager, suffering from stress, left the job at year’s end along with the finance director. The new city manager, Allen Parker, declared personal bankruptcy in 2010 when hit with legal fees in a disputed Banning Heights water company election. Last week a group announced a drive to gather the voter signatures needed to place a recall on the November ballot of Mayor Pat Morris, City Attorney James Penman and all seven city council members. Penman told the San Bernardino Sun newspaper that “out-of-town business people who supported Morris” are pushing the recall. Morris does not plan to run for re-election. Penman has twice run against Morris for mayor and lost. Morris backed an unsuccessful ballot measure to make the elected city attorney appointed. Penman had his office investigate Morris and others for alleged campaign law violations. After Penman refused to sign off on an unbalanced budget in 2011, a group of “mostly non-residents” recruited a candidate who unsuccessfully ran against him, he wrote in an op-ed column for the Sun on April 28. The city plans a $26 million cut in salaries and benefits this fiscal year, mainly from reducing full-time positions from 1,141 to 941. Agreements were negotiated with four unions, but similar cuts had to be imposed on three unions, including police. The police employee share of CalPERS contributions, 9 percent of pay, had been paid by the city along with the employer share, 30 percent of pay. The imposed contract requires police to begin paying the employee share, a big bite out of their paycheck. 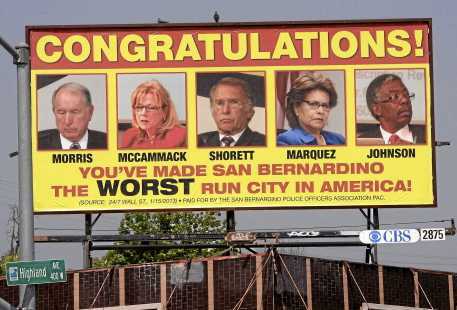 Last week the police union put up a big billboard sarcastically “congratulating” city council members who voted to impose the benefit cut for making San Bernardino “the worst run city in America” according to an investment website survey. “Right now, it looks like everyone’s at everyone’s throat,” an auto dealer told the Sun last week. In Stockton, the police union bought a house next to the city manager’s home and used billboards to call Stockton one of California’s most dangerous cities, deplore the layoff of cops, tally homicides and post the city manager’s phone number. The Stockton bankruptcy has not been a dramatic emergency: A 90-day mediation with creditors failed, the city issued a 790-page restructuring plan, agreements were reached with all unions and a court ruled the city eligible for bankruptcy last month. But a split among elected officials has emerged. A new mayor, Anthony Silva, and others want to put a half-cent sales tax increase on the November ballot to hire 100 more police. Last week a meeting of a coalition backing the tax proposal featured William Bratton, the well-known former police chief of Los Angeles, New York and Boston who advocates putting more cops on the street. The tax proposal is opposed by the city manager, Bob Dies, and a majority of the city council, the Stockton Record newspaper said. They fear the tax could create general fund problems and jeopardize the exit from bankruptcy. Opposition to Stockton’s eligibility for bankruptcy was led by bond insurers. One of their objections was the city proposal to cut bond debt but not the pension debt owed CalPERS, the biggest creditor. CalPERS is leading the opposition to San Bernardino’s eligibility for bankruptcy, contending it’s not clear that the city lacks cash needed to make pension contributions. Another court hearing is scheduled Tuesday. This entry was posted on May 6, 2013 at 7:14 am and is filed under Bankruptcy, CalPERS, Operations, San Bernardino. You can follow any responses to this entry through the RSS 2.0 feed. You can skip to the end and leave a response. Pinging is currently not allowed. Ah yes …. a debtor’s prison for everyone EXCEPT the super-PROTECTED Public Sector Plan participants who (per CalPERS) must get ALL of what was “promised” them, not matter has shady and unjust the deals that lead to those grossly excessive pension and benefit promises, and no matter how broke the Taxpayers being told to foot the bill. US GOVERNMENTS ARE NOW BEGINNING TO BREAK THEIR CONTRACTS IN ORDER TO MAINTAIN LOW TAXES ON THE WEALTHY AND CORRPORATIONS. PUBLIC WORKER CONTRACTS HAVE BEEN DEEMED INFERIOR TO CORPORATE CONTRACTS. In 2010, the Colorado Legislature enacted a bill, SB10-001, to take accrued, contracted public pension (Colorado PERA) benefits from elderly pensioners in our state. These contracted pension benefits were earned over 30 years. The pension benefits average about $28,000. The Colorado Legislature underfunded the PERA pension system for a decade, putting financial pressure on the system and lowering its “funded ratio.” Next, the Legislature claimed that this lowered funded ratio justified the breach of the State of Colorado’s contracts with its pensioners. Their average age is 70 years. Colorado has the 15th highest per capita income in the nation. There are sixty-four counties in Colorado. Ten of these counties are among the 100 richest counties in the nation. Yet, apparently we cannot afford to honor the State of Colorado’s contracts. This theft from the elderly in Colorado is supported by most of the Colorado media, 27 Colorado lobbyists who forced the bill through the legislative process, and public employers affiliated with the PERA pension system that want to easily slash their public pension debt. The retirees have no lobbyists and little voice. Visit saveperacola.com for the whole ugly story. Indeed, public sector pensions are super-protected by contract law and the California constitution… and those super-protections were enacted by politicians legally elected by voting citizens of California. The only entity to point a finger at is the voting citizens. And of course many of the pension increases, like those in 1999, where strongly supported by both Republican and Democratic legislators. Tough Love probably makes part of his living by telling one side of this story… rarely if ever see him post that the Republicans are equally responsible for California’s pension mess, or see him post about the similar greedy excesses of the private sector. unfortunately that does not cause debts to be vacated. The County gets saddled with them. In the end, I see only 3 ways out of this mess: 1)The securities markets recover; 2)the public pensions are reduced by negotiation; 3)California goes in to sovereign default. The most probable is 1). then 3). Then 2). No, Al, These “contracts”, negotiated in backroom deals in which the Taxpayers’ rights were ignored and trampled upon by the Public Sector Union/Politician cabal, should rightfully be reneged upon to the extend they exceed what the Taxpayers (called upon to pay the bill) get from their employers. A 50% reduction in these “promises” should be just the FIRST step in that direction. Earth to Spension …. it’s not about me and ot’s not about the Private Sector ….get off the fixation …. it’s IS about the excessive Public Sector pensions and benefits that are drowning California’s (and many other State’s) Cities and towns and the Taxpayer’s right to say no, these ridiculous “promises” need to be rolled BACK, and for CURRENT, not just new workers. San Bernardino’s debt to CalPERS has no connection with debts of the State of CA. The State of CA’s total yearly payment to CalPERS is only three percent of the total state budget, so I doubt the State of CA would ever consider going into sovereign default over that–or anything. SeeSaw, Spension knows that …. he’s on the sucking end of this gravy train (as are you) and in all his comments he tries to deflect attention from the focused need to materially reduce the promised pensions & benefits of CURRENT workers to all sorts of irrelevant issues. Cut the disinformation, Tough Love. Its all about a cynical society where greed is good, both in the private and public sectors. I’m all for reduction of public sector pensions, but unlike you, I give a practical prescription for how to do it. You just emanate gases of elevated temperature. And I’m all for eliminating the taxpayer subsidies of excessive compensation in the private sector, such as in the health care business, or in the Wall Street bailout. Spension, Talk about gasses, All we hear from you is that non action on “sovereign default” precludes pension reductions. Baloney. Taking remedial action on excessive Public Sector pension needn’t be linked to a sovereign default. Excessive pay, pension, and benefits (as measured by a comparison to the same granted comparable Private Sector workers) takes unnecessarily and unjustly out of the Taxpayers’ pockets … even when the city & towns have hefty surpluses. It is good that CalPERS refuses to go to the table, when it comes to the pension debt of San Bernardino. If that were to happen, a precedent would be set, beginning the unraveling of the CalPERS plan. If SB had made its payments when they were due, it would not be in its current position. It will take years for SB to recover but if it puts its nose to the grindstone, it will, eventually. – What happens when a county goes bankrupt, Spension? What kaos will occur when school districts start going bankrupt, Spension? You can keep making your silly claims but the math will rule the day. – None of those things will happen in time to solve the problem. Even though taxpayers are already paying three times the original cost for pensions CalPERS is claiming – and rightfully so, that costs are going to increase by 50%. This mess is going to be resolved in the courtroom. Uh… what? I’m all for a negotiated pension reduction. Sovereign default is the backstop. Without mentioning it, pensioners wouldn’t negotiate. Comparable private sector workers to the top level executives in the State get post employment benefits that are typically $200 million… http://origin.library.constantcontact.com/download/get/file/1102561686275-69/GMI_GoldenParachutes_012012.pdf . Private sector golden parachutes completely skew State post-employment benefits at the highest levels. And at the lower levels of public employees they try to get as greedy as their superiors. As for `just’, well, all the pensions you rant about were duly approved by near-unanimous majorities of both Republicans and Democrats. Absolutely just and legal. It is the voters who voted them all in who are at fault. Either you’re in favor of democracy or your not, Tough Love. Which are you? Spension, how does your rant about private sector “golden parachutes” solve the problem of ridiculously generous pension & retiree health care benefits that are strangling the funds that pay for basic county/city services? This is “California”, the Public Sector Union capital of the world. Spension, You have nothing useful to offer. The *facts* about private sector golden parachutes illustrates the greed that permeates both the private sector and the public sector. Jack Welch gets $400 million (mainly through cost+ government contracts from the taxpayer) so many of the public unions and pensioners want to become little Jack Welches. I’m fine with a $400 million golden parachute if all the money was earned without a single government contract, FDIC guarantee, lobbyist influencing government, or marketing campaign. Tough Love, fine, if no negotiations, then one logically gets to the conditions you describe, which is… sovereign default of the State of California. 10 or 20 sovereign defaults of states have happened in US history, not including the default of the Confederate States of America. You are ranting without a practical way to go forward; the only way to break the contracts that were duly, justly, and legally negotiated with public unions and other public employees is… sovereign default. Part of that process could be revising the State Constitution. Oh, good god! The CalPERS bottom line is 263+ billion right now. There are over 500,000 CalPERS annuitants receiving monthly benefits. The average benefit of all those public workers who just retired in 2012 is $3025/mo. Little Jack Welch, “wannabes”, my foot! All we, and they, want is a normal living! There is going to be no negotiation for lower pensions and, obviously, there is never going to be a sovereign default in CA! The Wikepedia lists the only sovereign default in CA, in the last 100 years, as that of Orange County, CA in 1993–and no pensions were touched. Get off these rants, people! CA just recently passed pension reform–give it a chance, and go on about your own business. I suggest you have your eyes and heading checked. Seesaw… what matters is not the figure of $3025/month, but that figure suitably adjusted for service credits. I didn’t say every public union member or recipient of a public pension is a little Jack Welch, but I do think many are. For example, Bruce V. Malkenhorst of Bell, with a public pension of $530,000/year is certainly a little Jack Welch. 3% at 50 is another example of an outrageously high benefit. A high-school graduate who worked 30 years and retires at 50 with 90% of their pay is too much. On the other hand, the fix pensions first report i’ve referenced many times shows that the pension benefits of a typical California teacher aren’t greatly higher than the average private sector worker. Bruce Malkenhorst was the CM of Vernon which is basically a family-run city–corrupt in my view. And his pension was corrupt–CalPERS cut it down to $100,000+ last year. He and the CM of Bell are, in no way, examples of public employees–they are greedy human beings, regardless of where they worked. You aren’t going to find many public safety workers who retire at age 50 with 90% pay, because the do not get into full-time safety careers, on average, until the late 20’s. The 3% at 50 formula is no longer in existence in CA, for future employees, as well as other retirement formulas. My former municipal employer scuttled the 3% at 50 for safety in 2005 and the 3% formulas for miscellaneous prior to the recent State reform law. That’s why I say–you can fuss and moan all you want about the pensions that are already in effect–the law protects those pensions in the State of CA. Its time to get over it, and let the new pension reform law work. I will just continue to state–the average CalPERS pension is not excessive. However, another measure of the fairness and sustainability of all public pensions is the yearly contribution the State must make to CalPERS and CalSTRS… normal cost + liability makeup at 30+% is just way too much. I know a contract exists, I know the strength of the pertinent law, but sorry, nobody short of the little Jack Welches of the world get 30+% extras without amazing job performance. I would cap total contributions at 20%, and if the pension system causes the state to go into sovereign default, so be it. You don’t just do what, “you would”. There are legal procedures that must be followed. CalPERS would never be a reason for the state of CA to go into default, because the state’s liability for those payments is only 3% of the total budget. Sure, and the legal procedures lead to breathtaking high State contributions to CalPERS, 30+% for non-safety and 40+% for safety. I get that. The important point: regular working people never get huge additional contributions (at the level of 20% of their salary) on autopilot. That drives a lot of anger and resentment. That such increases are legally programmed in just drives cynicism, as exhibited on this board. I certainly understand that a whole lot of public pensioners are not getting rich off their pensions. However, it is very important to be honest with the statistics, and not lump in people with only 5 or 10 years of service credit so as to drag down the average. Or to point to the elderly public retirees who have lower pensions because the formulas were lower in the past. Doing that stuff just drives more cynicism. CalSTRS doesn’t get increments on autopilot, and there will be a heck of a fight in the State legislature to approve contributions as high as 30+% to bring CalSTRS back to full funding. In the distant past the advocates of solid public pensions understood that the volatility of the stock market was a great danger, because of exactly the problems we are having now. Basing public pensions on state bond rates was more conservative (and led to lower pensions). But the greed-is-good, little Jack Welch problem has infected our public sector, allowed betting public pension funds in the Wall Street Casino, and has now left taxpayers holding the bag for Wall Street’s well known frauds. Of course I understand that public pensioners pay taxes too, but on the balance, they get a bigger benefit from the system than the majority of other taxpayers. The lower formulas for new hires are a good solid step. I don’t think they are enough, though. One legal outlet would be to recover excessive public pensions via new state taxes that would only apply to public pensions, and would specifically target folks who did retire at 50 with 3%, or like William Garret of El Cajon, who gets $24,000 a month. I don’t think that would violate any of the pension agreements. Another whole set of the over-pensioned are university professors and administrators. Not a union issue at all. Spension, while your 20% is arguably too high (being significantly greater than the %-of-pay Private Sector employer contributions towards their employees’ pensions) you’re on the right track. But instead of again drifting off to “sovereign default” if your proposed cap is insufficient to fund the promised pensions, then the pensions must be sufficiently reduced to fit within the limitations of the cap. Tough Love, you never provide any practical way to reduce pensions. There is only one practical mechanism: sovereign default. Spension, States, such as CA, have no means of legal “sovereign default”. Sure, they can stop paying (or slow down and “defer” payments as Illinois has done, owing $10 Billion in bills for products provided and services already rendered) certain bills, but how does this get us to the needed pension reduction at the State level? California just repudiates its debts, like Florida, Mississippi, and Arkansas did in 1841. Seems to me they all legally still exist…. even though they did try to leave the union in the interim. Spension, Well, when the Sh** hits the fan (and it surely will, likely Illinois being first), it certainly will be interesting to watch as those riding this gravy train DEMAND full payment of their VERY generous promised pensions and heathcare benefits from those mostly getting 1/4-1/2 of those promised amounts. Most retirees know that their health benefits are at risk, TL. As far as the pensions are concerned, don’t hold your breath waiting for them to be cut, or you will turn blue. Well, Seesaw is right, the crisis will take a long, long time… the yearly expenses of pay-as-you-go pension situation are a relatively small fraction of the total Calfornia Budget. But who can tell what having giant unfunded liabilities for future pensions on the books will do to all sorts of California finances…. might well drive the State to Sovereign Default. I predict that people will have to pay their obligations. Turns out that the bk judge is a very smart fellow. I wonder where the alarm was during the pension vacation years? This seesaw person again is correct. Bjorne, As services decline and taxes rise to pay those (grossly excessive) “obligations”, that (“having to pay for them”) will change unless CA puts up the equivalent of a Berlin Wall, and refuses to let it’s Businesses and residents leave without an Exit Tax. Property taxes have a cap in CA, and cannot be raised to pay the “obligations” without a vote of the affected property owners. So, don’t be concerned, TL. With 39,000,000 inhabitants, CA could stand to lose a few.